An edited audio recording of the presentation was broadcast on this week’s Renegade Economists radio show. Note: The opinions expressed in this talk are solely those of the speaker in his private capacity, and should not be attributed in any way, expressly or indirectly, to his employer or to any other organization or agency with which he may be associated . I appreciate very much the opportunity to talk to you at the 122nd Annual Henry George Commemorative Dinner. Henry George was one of the more innovative economic thinkers of the 19th century, and it is in some ways a pity that his work is not better known among those who do know at least a little of the history of economic thought, as that of some of his contemporaries such as John Stuart Mill, William Stanley Jevons, or Alfred Marshall still is today. I first ran across him when I was studying Australian History at Year 12, and focusing in particular on the Great Depression of the 1890s. I learned then that George’s advocacy of a single tax on the unimproved value of all privately-held land had found favour with sections of the then newly-emerging Australian labour movement. Perhaps for that reason, those Australians who have actually heard of Henry George usually place him on the left of the political spectrum. Yet that is a gross over-simplification. He was also a strident advocate of restrictions on Asian immigration – as was the Australian Labor Party in its early days, and indeed right up until the 1960s – although these days, that is a position usually associated with the extreme right. Like most other economists, he was concerned about the existence and exploitation of monopoly power. And, also like most other economists, in his time and today, he was an advocate of free trade, pointing out that tariffs are not something that foreigners pay to get their goods into the country which imposes them, but rather something that a country’s government makes its own citizens pay in order to keep foreigners’ goods out: or, as he put it, “it is not from foreigners that protections preserves and defends us: it is from ourselves” (George 1905: 45-46). Nor is the advocacy of a greater role for the taxation of land in taxation systems an exclusively left-of-centre position. Adam Smith, commonly if not entirely accurately regarded as the father of “laissez faire”, proposed what he called ‘ground rents’ as ‘a proper subject of taxation’ a century before Henry George (Smith 1776: Book V, Chapter 2). Milton Friedman – who in no sense could be characterized as being anywhere near left-of-centre (notwithstanding his principled advocacy of the decriminalization of drug use) – once said that, in his opinion “the least bad tax is the property tax on the unimproved value of land, the Henry George argument of many, many years ago” (Friedman 1978). The Economist – the antithesis of a ‘socialist rag’ – earlier this year stated that “taxing land and property is one of the most efficient and least distorting ways for governments to raise money”, citing an OECD study suggesting that “taxes on immovable property are the most growth-friendly of all taxes” (Economist 2013: 70). The Henry Review of the Australian taxation system concluded that “land is an efficient tax base because it is immobile; unlike labour and capital, it cannot move to escape tax” and that “economic growth would be higher if governments raised more revenue from land and less revenue from other tax bases” (Henry 2009: 247). Henry George would have been pleased. All of this notwithstanding, very few economists – and I am not one of them – would today accept that it would be either possible, or even if it were possible, desirable, for a land tax to be the sole source of government revenue, as Henry George advocated. He was writing at a time when government revenue requirements were substantially smaller than they are today; and when it was far less likely than it is today that people could be ‘asset rich but income poor’. But there is still a very sound case for the taxation of land to play a greater role in raising revenue for public purposes than it does today. Housing is important. It meets a variety of deeply personal needs, including those for shelter and (ideally) security. It provides a sense of attachment (the place where we live) and, for many people, contributes to their sense of identity. These are pretty basic needs for almost all of us, as human beings. In addition, for many people, it is an important means of building wealth (and often the most important one); and for some, it provides the foundation for starting a business. In Australia, most of us are well-housed – at least in a physical sense. Although it hasn’t always been the case, and it isn’t the case for all Australians today (not least for Indigenous people), most of us live in houses or apartments that are well-constructed, amply fitted with various devices that make the accomplishment of household tasks easier than it was in our great-grandparents’ day, and replete with other appurtenances and chattels that in some way or other provide us with enjoyment or add meaning to our lives. That isn’t the case in many other parts of the world. In July, I spent a week in Madagascar, which according to the IMF is the sixth-poorest country in the world, measured in terms of purchasing-power-parity per capita GDP. It ranks 151st (out of 186 countries) on the United Nations latest Human Development Index. People in Madagascar are not, in general, well housed. From my own observation, outside of the capital, Antananarivo, most people in Madagascar live in wooden or mud-brick huts that, in many cases, are smaller than the lounge room of a typical new Australian house, with roofs made of thatch, and in many cases without glazed windows. It puts our housing issues into a different perspective. Reflecting the importance of housing to people’s well-being, as well as to many broader objectives, Australian Governments of all political persuasions have long purported to attach a great deal of significance to goals such as promoting home ownership, improving housing affordability, and increasing housing supply. between 1947 and 1961, the housing stock increased by 50% -compared with a 41% increase in Australia’s population over this period. The Commonwealth and State Governments directly contributed 221,700, or 24% of the total increase in the housing stock over this period, through programs financed under the Commonwealth-State Housing Agreements, or under the War and Defence Service Homes Schemes. during this period, the home ownership rate increased from 53.4% to 70.3% -the largest increase in home ownership in Australia’s history. 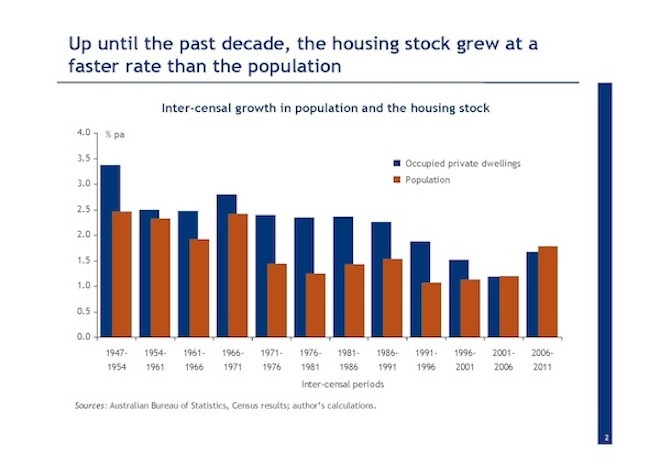 between 1961 and 1976, the housing stock increased by a further 46% -again outstripping the 33% increase in Australia’s population over this period. During this period, the Commonwealth and State Governments directly added a further 299,000 dwellings to the housing stock, equivalent to 23% of the increase in the total housing stock over this period. during this period, the home ownership rate fluctuated between 68% and 71%, but remained at a high level by international standards. In other words, during this period, Federal and State Government housing policies were principally directed towards increasing the supply of housing, and at increasing or maintaining home ownership rates. And these policies actually achieved those objectives. There were downsides to these policies, of course – in particular, many of the dwellings built by State housing authorities, and by the private sector, were poorly located from the standpoint of access to employment, lacked basic infrastructure and community services, and inadvertently served to concentrate socio-economic disadvantage. But they did ensure that a rapidly-growing population was at least adequately housed, and they gave many families an opportunity to gain a first foothold on the home ownership ladder that they would otherwise not have had. Even between 1976 and 1991, the housing stock increased at a much faster rate – 41% than the population – 23% -although only 9% of dwelling completions during this period were by the public sector. But the relationship between growth in the housing stock and population growth began to change after the early 1990s. Between 1991 and 2001, Australia’s population grew by 11.5% , while the housing stock grew by only 18.3% -less than 9 pc points more than the population. And between 2001 and 2011, while the population grew by 15.9%, the housing stock grew by only 15.2%. That is, over the past decade, the housing stock has grown at a slower rate than the population – for the first time since the end of World War II. 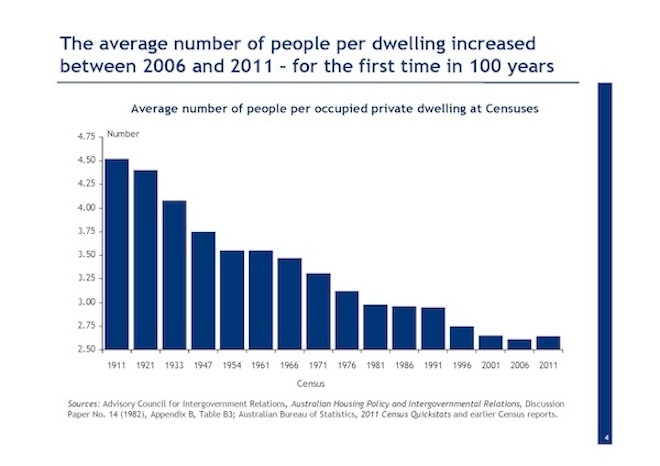 Yet, in the face of these ongoing trends, the average number of people per dwelling actually rose (from 2.61 to 2.64) between the 2006 and 2011 Censuses – for the first time in at least 100 years (since the first Commonwealth Census was conducted in 1911 – see Chart 3). From 1911 to 2006, the average number of people per dwelling had fallen from 4.52 to 2.61. It would seem that the widespread angst among ‘baby boomer’ parents about how difficult it is to get their 20-(and in some cases 30-) something children out of the family home has a sound basis in fact. This is what the National Housing Supply Council, of which I’m a member, means when it estimates that Australia has a ‘shortage’ of housing relative to the ‘underlying’ demand for it – a shortage which it last estimated to be of the order of 228,000 dwellings as at 30 June 2011 (NHSC 2012: 24-25). That 228,000 figure is not an estimate of the number of homeless people in Australia (which the ABS put at just over 105,000, a number which included 41,390 people living in ‘severely overcrowded’ dwellings, at the 2011 Census – ABS 2012). Rather, it reflects the gap between the existing housing stock, and what the Council estimates the stock would need to be if household formation patterns had remained essentially unchanged over the past decade. In passing, I should note that these estimates pre-date the results of the 2011 Census, which has resulted in some downward revisions to the estimated level of Australia’s population compared with those which had been based on extrapolations from the 2006 Census, and which will lead to some consequential revisions to these estimates of the housing ‘shortage’. However, it would be a mistake to think – as some other commentators have – that the revisions prompted by the 2011 Census results have eliminated the ‘housing shortage’ which the National Housing Supply Council and others had previously identified (see NHSC 2013: 107-123). 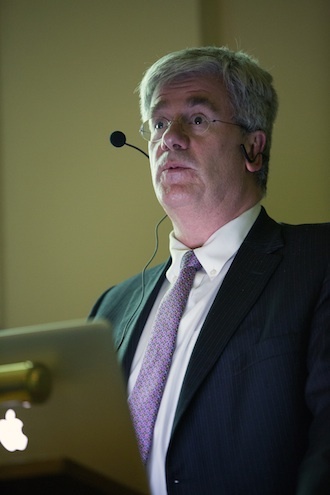 Nor, in my view, is the idea that there is a ‘housing shortage’ in the sense intended by the NHSC contradicted by the work that Philip Soos has undertaken for Earthsharing Australia, using data from Melbourne water suppliers to show that up to 6% of residential properties across the Melbourne metropolitan area may have been vacant during the second half of 2011 (Soos 2012). If those vacant properties aren’t available (for whatever reason) for sale or rent then their existence does not detract from the existence of a housing shortage – although it may well be, as Philip argues, that an increase in land tax could prompt at least some of the owners of those properties to make them available for sale or rent. First, the direct contribution of the public sector to growing the housing stock has declined substantially. From the mid-1950s to the mid-1970s, public sector agencies completed an average of 15,512 new dwellings per annum (and they indirectly financed the completion of another 3,600 dwellings annually through low-interest loan schemes). From the mid-1970s to the early 1990s, they completed an average of 12,379 new dwellings per annum. But since then, they have completed an average of less than 6,000 new dwellings per annum (indeed between 1999 and 2009 the public sector built fewer than 4,000 new dwellings per annum, on average). Second, state and local government planning schemes and policies for charging for the provision of suburban infrastructure have made it increasingly difficult for the private sector to supply new housing, especially at the more affordable end of the spectrum. This second reason has three distinct dimensions. First, state and local authorities have imposed increasingly more onerous requirements on developers for the provision of infrastructure and services in new housing estates. While that undoubtedly represents ‘progress’ in many respects – and certainly adds to the amenity of ‘greenfields’ developments from the perspective of those who move into them – it comes at a cost. Second, local authorities have changed the way in which this infrastructure and these services are provided, from a model based on paying for them largely through debt, which was then serviced and repaid out of subsequent increases in rate revenues, to one based on paying for them through ‘up front charges’ on developers. While this is consistent with a ‘user pays’ philosophy, and appeases the growing voter aversion to public debt, it has meant (especially in New South Wales, where developer charges have risen to much higher levels than in other States) that developers find it increasingly difficult to produce house-and-land packages at prices which are affordable for first-time buyers and still make a profit, so they have reacted by building a smaller number of more expensive houses targeted at the trade-up market. Third, metropolitan planning authorities and inner-city local governments have made it increasingly more time-consuming and onerous to undertake higher-density or ‘infill’ developments on ‘brownfields’ sites – in particular by imposing tighter planning controls, and by providing more opportunities for objections to and appeals against planning decisions. As with the more onerous requirements for infrastructure provision in ‘greenfields’ sites, there are two sides to this story, and I have a lot of sympathy with the desire of residents in established areas to prevent developments which detract materially from their quality of life (and/or from the value of their properties). But whatever perspective one might take on that debate, there is no doubt that developments in planning law have contributed to the mismatch between housing demand and housing supply. What is also noticeable about the last twenty years is that – despite mortgage interest rates having been substantially lower, on average, over this period (7.59% pa over the past 20 years, compared with 11.95% over the preceding 20), and despite unprecedented expenditure on grants to first home buyers – the overall home ownership rate has actually declined by 5 percentage points, to 67% at the 2011 Census, its lowest figure since the 1954 Census. In fact the decline in home ownership has been even more pronounced when one ‘looks through’ the effects of the ageing of the population, which (among other things) means that an increasing proportion of the population is within age groups where home ownership rates are always (and for obvious reasons) higher than in younger age cohorts. 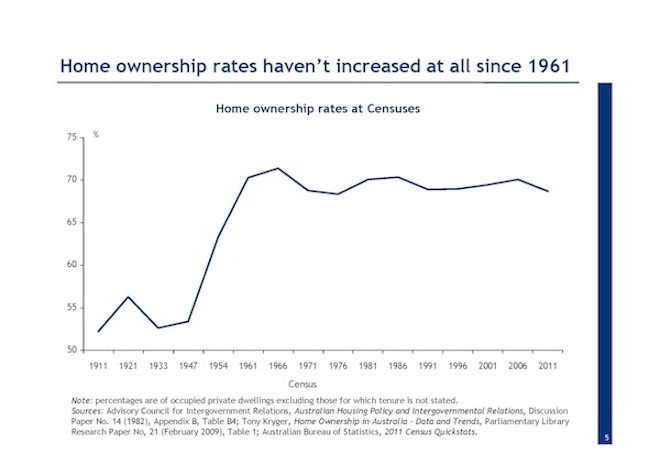 Research by Judy Yates of the University of NSW shows that home ownership rates among younger age groups declined dramatically between the 1991 and 2011 Censuses – from 56% to 47% among 25-34 year olds; from 75% to 64% among 35-44 year olds; from 81% to 73% among 45-54 year olds; and 84% to 79% among those over 55. 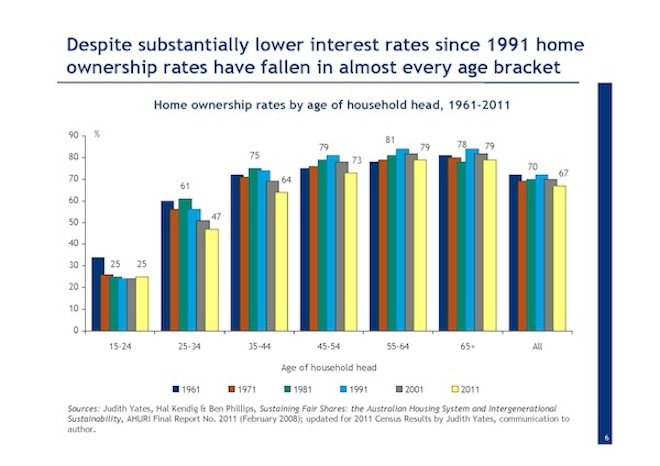 In fact the only age cohort among whom home ownership rates didn’t decline over the past 20 years was 15-24 year olds: but that was only because their home ownership rate had already fallen 34% in 1961 to 24% by 1991 and didn’t decline any further. The decline in home ownership rates among younger age groups is almost certainly due in part to changing preferences (including partnering and having children at older ages, and greater importance attached to proximity to employment or entertainment venues): but it also undoubtedly owes more to declining affordability. This may be partly due to the fact that households can, and do, use mortgages for other purposes apart from simply acquiring the property which is mortgaged: but I think it is far more due to the fact that people need to borrow much more money initially in order to acquire a property now than they did 20 years ago. So, when set against the stated objectives of the housing policies pursued by successive governments of various political persuasions, the results have been dismal. Although most Australians are, as I noted at the beginning, physically well housed, it can no longer be said that we are, in general, affordably housed; nor can it be said that the ‘housing system’ is meeting the needs and aspirations of as large a proportion of Australians as it did a quarter of a century ago. And in making that assertion I am thinking of the extent to which the housing system meets the needs and aspirations of those who don’t want, or can’t and won’t ever be able to, become home-owners, as well as of those who do seek that status. That is why I gave this talk the title, ‘Fifty Years of Failure’. In order to develop that proposition more fully, I want to turn now to two of the principal policies which governments of both persuasions have pursued throughout this period. 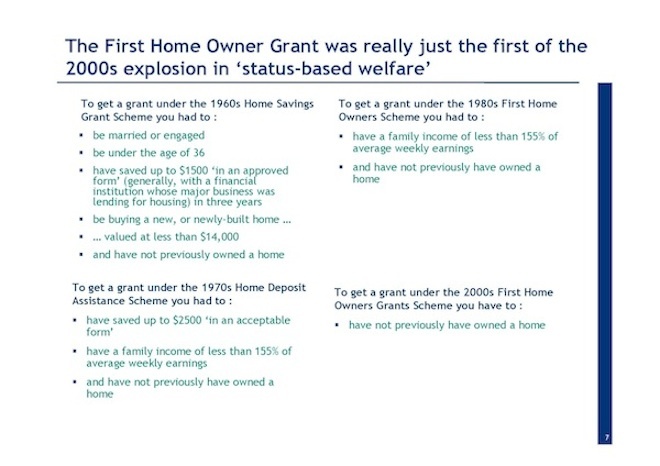 The Commonwealth Government started giving cash grants to first home buyers in 1964 when, at the urging of the New South Wales Division of the Young Liberal Movement (whose President at the time was a young John Howard), the Menzies Government began paying Home Savings Grants of up to $500 to ‘married or engaged couples under the age of 36’ on the basis of $1 for every $3 saved in an ‘approved form’ (generally, with a financial institution whose major business was lending for housing) in the three years prior to buying their first home, provided that the home was valued at no more than $14,000. This scheme was abolished by the Whitlam Government in 1973 (in favour of an income tax deduction for mortgage interest payments by persons with a taxable income of less than $14,000 per annum); re-introduced under the name of Home Deposit Assistance Grants (without the age or marriage requirements and the value limits, and with a larger maximum grant of $2,500) by the Fraser Government in 1976; replaced by the Hawke Government in 1983 with the First Home Owners Assistance Scheme, initially with a maximum grant of $7,000 (later reduced to $6,000) and subject to an income test; abolished by the Hawke Government in 1990; and then re-introduced as the First Home Owners Grant (FHOG) by the Howard Government in 2000, without any income test or upper limit on the purchase price of homes acquired, ostensibly as ‘compensation’ for the introduction of the GST (even though the GST only applied to the purchase of new homes, and not to existing dwellings which the majority of first-time buyers purchase). In this guise it was really just the first of what became an explosion in ‘status-based welfare’ payments to selected groups irrespective of needs during that decade. On two occasions since 2000, the FHOG has been temporarily increased in response to an actual or feared slump in housing activity (and in 2008, in response to a feared decline in house prices). Over the past decade, most State and Territory Governments have ‘topped up’ the basic FHOG payments to first-time buyers with grants from their own resources, with some States providing even larger grants to buyers meeting certain additional criteria (for example, the Victorian Government provided an additional $5,000 for buyers of new homes in rural and regional areas). 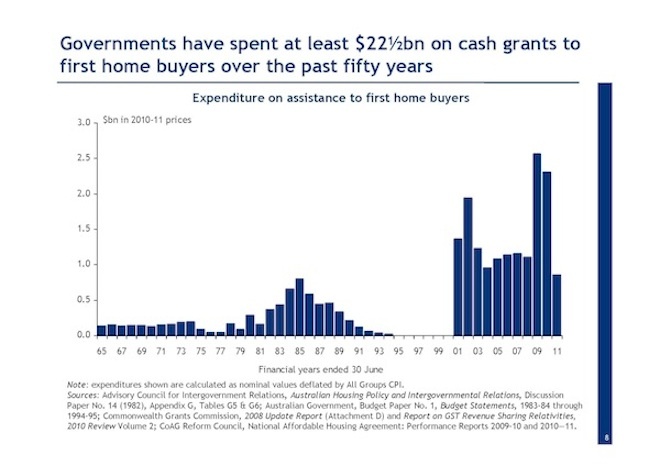 I estimate that the Commonwealth, State and Territory Governments spent a total of $22.5bn (in 2010-11 dollar values) on cash grants to first home buyers between 1964 and 2011. State and Territory Government also provide indirect financial assistance to first-time buyers by partially or totally exempting them from the stamp duty they would otherwise pay on their purchases. In 2011-12 alone, these were worth around $3bn. Governments have thus been providing cash handouts to first-time home-buyers for almost half a century. 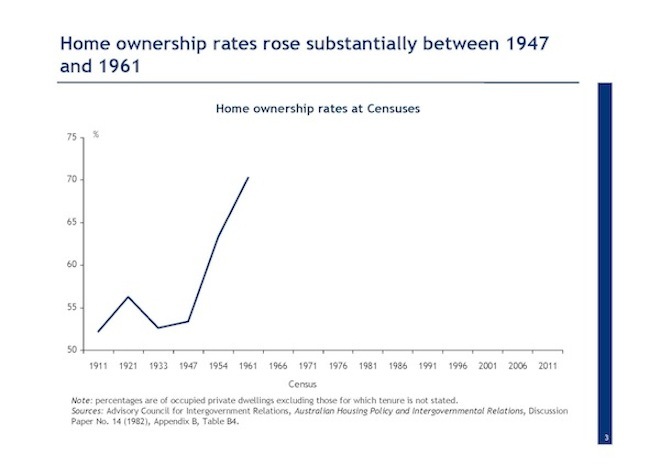 Yet, as I mentioned earlier, the overall home ownership rate has never been higher than it was at the 1961 Census, immediately before governments started going down this path; and among the age groups which are supposedly most intended to benefit from these handouts, home ownership rates have declined almost vertiginously over the past two decades. And it’s pretty obvious why. Cash grants and other forms of assistance to first-time home buyers have served simply to exacerbate the already substantial imbalance between the underlying demand for housing and the supply of it. In those circumstances, cash handouts for first home buyers have simply added to upward pressure on housing prices, enriching vendors (and making those who already housing feel richer) whilst doing precisely nothing to assist young people (or anybody else) into home ownership. For that reason, I often think that these grants should be called ‘Existing Home Vendors’ Grants’ – because that’s where the money ends up – rather than First Home Owners’ Grants. Encouragingly, perhaps – after what in my case has been more than 30 years of putting this kind of argument – State and Territory Governments appear at last to have gotten this message. Over the past 18 months or so, every State and Territory Government has either abolished or at least substantially reduced grants to first home buyers who buy existing dwellings, whilst increasing their grants to those who buy new ones, with a net effect of reducing the total spend on assistance to first home buyers. I have no doubt that some of the increased grants to first time buyers of new homes will end up boosting developers’ or builders’ profits: but I accept that at least some of it will induce a supply side response to any resulting increase in demand for new homes, while considerably fewer taxpayers’ dollars will be wasted inflating the prices of existing homes. Another long-standing policy which I have long argued has not only failed to deliver on its oft-stated rationale of boosting the supply of housing – in this case for rent – but has actually exacerbated the mis-match between the demand for and the supply of housing, as well as having distorted the allocation of capital, and undermined the equity and integrity of the income tax system, is so-called ‘negative gearing’. It is perhaps a telling indication of just how generous Australia’s tax system is to investors in this regard, compared with those of other countries, that one usually needs to explain to foreigners what the term ‘negative gearing’ actually means (see for example RBA 2003: 4045). ‘Negative gearing’ originally allowed taxpayers in effect to defer tax on their wage and salary income (until they sold the property or shares which they had acquired with borrowed money, on which they were paying more in interest than they received by way of dividends or rent). 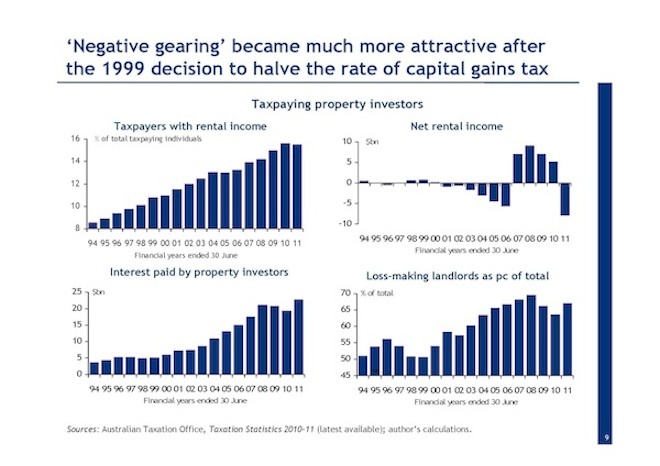 However, after the Howard Government’s 1999 decision to tax capital gains at half the rate applicable to other income (instead of taxing inflation-adjusted capital gains at a taxpayer’s full marginal rate), ‘negative gearing’ became a vehicle for permanently reducing, as well as deferring, personal tax liabilities. And the availability of depreciation on buildings adds to the way in which ‘negative gearing’ converts ordinary income taxable at full rates into capital gains taxable at half rates. It’s therefore hardly surprising that ‘negative gearing’ has become much more widespread over the past decade, and much more costly in terms of the revenue thereby foregone (see Chart 6 above). In 1998-99, when capital gains were last taxed at the same rate as other types of income (less an allowance for inflation), Australia had 1.3 million tax-paying landlords who in total made a taxable profit of almost $700mn. By 2010-11, the latest year for which statistics are presently available, the number of tax-paying landlords had risen to over 1.8mn (or 14% of the total number of individual taxpayers), but they collectively lost more than $7.8bn, largely because the amount they paid out in interest rose more than fourfold (from just over $5bn to almost $23bn over this period), while the amount they collected in rent ‘only’ slightly less than trebled (from $11bn to $30bn), as did other (non-interest) expenses. If all of the 1.2mn landlords who in total reported net losses in 2010-11 were in the 38% income tax bracket, their ability to offset those losses against their other taxable income would have cost over $5bn in revenue foregone; to the extent that some of them are in the top tax bracket then the revenue loss is obviously higher. This is a pretty large subsidy from people who are working and saving to people who are borrowing and speculating (since those landlords who are making ‘running losses’ on their property investments expect to more than make up those losses through capital gains when they eventually sell them). And it’s hard to think of any worthwhile public policy purpose which is served by it. It certainly does nothing to increase the supply of housing, since the vast majority of landlords buy established properties: 92% of all borrowing by residential property investors over the past decade has been for the purchase of established dwellings, as against about 72% of all borrowing by owner-occupiers. Precisely for that reason, the availability of ‘negative gearing’ contributes to upward pressure on the prices of established dwellings, and thus diminishes housing affordability for would-be home buyers. This assertion is actually not true. 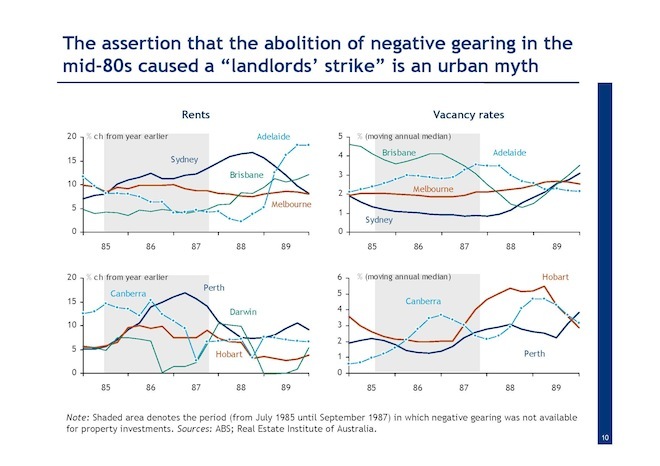 If the abolition of ‘negative gearing’ had led to a ‘landlord’s strike’, as proponents of ‘negative gearing’ repeatedly assert, then rents should have risen everywhere (since ‘negative gearing’ had been available everywhere). 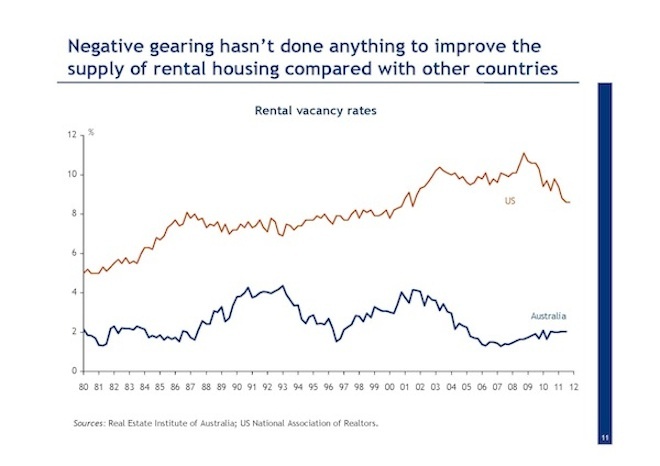 In fact, rents (as measured in the consumer price index) only rose rapidly (at double-digit rates) in Sydney and Perth – and that was because in those two cities, rental vacancy rates were unusually low (in Sydney’s case, barely above 1%) before negative gearing was abolished. In other State capitals (where vacancy rates were higher), growth in rentals was either unchanged or, in Melbourne, actually slowed (see Chart 9). There’s no evidence to support the assertion made by proponents of the continued existence of ‘negative gearing’ that it results in more rental housing being available than would be the case were it to be abolished (even though the Henry Review appears to have swallowed this assertion). Let me be clear that I’m not advocating that ‘negative gearing’ be abolished for property investments only, as happened between 1986 and 1988. That would be unfair to property investors. Personally, I think ‘negative gearing’ should be abolished for all investors, so that interest expenses would only be deductible in any given year up to the amount of investment income earned in that year, with any excess ‘carried forward’ against the ultimate capital gains tax liability, rather than being used to reduce the tax payable on wage and salary or other income (as is the case in the United States and most other ‘advanced’ economies). But I’d settle for the recommendation of the Henry Review (2009, Volume 1: 72-75), which was that only 40% of interest (and other expenses) associated with investments be allowed as a deduction, and that capital gains (and other forms of investment income, including interest on deposits) be taxed at 60% (rather than 50% as at present) of the rates applicable to the same amounts of wage and salary income. This recommendation would not amount to the abolition of ‘negative gearing’; it would just make it less generous than it is at the moment. It would be likely, as the Henry Review suggested, ‘to change investor demand toward housing with higher rental yields and longer investment horizons [and] may result in a more stable housing market, as the current incentive for investors to chase large capital gains in housing would be reduced’. I could even accept the Henry Review’s recommendation that “these reforms should only be adopted following reforms to the supply of housing and reforms to housing assistance’ which it makes elsewhere, even though I disagree with the Henry Review’s concern that these reforms ‘may in the short term reduce residential property investment’. I could also accept, grudgingly, that any of these changes could be ‘grandfathered’, in order to minimize opposition from those who already have negatively geared investments, and who would understandably see the modification or removal of ‘negative gearing’ without such a provision as directly disadvantageous to them. However, the alacrity with which both major political parties moved to distance themselves from even these modest proposals in the Henry Review when it finally saw the light of day a few days before the 2009 Budget doesn’t provide much grounds for hope in that regard. What could be done instead? they have served to inflate the demand for housing – and in particular, the demand for already-existing housing – whilst doing next to nothing to increase the supply of housing. they have therefore made housing affordability worse, not better. and to the extent that the ownership of residential real estate is concentrated among higher income groups – 36% of all property owned by individuals, and 47% of all property other than owner-occupied dwellings, is owned by households in the top 20% of the income distribution (ABS 2013c) – they exacerbate inequities in the distribution of income and wealth. In passing, it is perhaps worth wondering why successive governments of various political persuasions have been so unwilling to alter policies which have not merely failed so abjectly to meet their stated objectives, but have demonstrably had such an adverse impact on those whom successive governments repeatedly assert they are keen to assist. At the risk of appearing cynical – not that, in my experience, being cynical about the motivations of political parties and governments carries a serious risk of leading one into making erroneous predictions about what they might be– I think the answer is obvious. While political parties and governments profess to care about first home buyers, the reality is that in a typical year fewer than 100,000 people succeed in attaining home ownership for the first time; whereas there are some 5.8 million households (and over 8 million people) who already own at least one property. Hence there are 100,000 votes for policies which might result in lower house prices, and over 8 million votes against policies which might result in lower house prices (or in favour of policies which result in higher house prices). As the Americans say: ‘do the math’. John Howard – who could ‘do the math’ better than most – often used to say that no-one ever came up to him complaining about the increase in the value of their home, or asking him to do things that would reduce the value of their homes so that younger people could buy them more readily. Nonetheless, if by some chance a political party really did want to advocate and implement policies that really would stand some chance of improving the capacity of the Australian housing system to respond to the needs and aspirations of Australian citizens, what might they say? Note that I am not advocating something that is often widely assumed to find favour with economists – namely, the removal of the exemption of owner-occupied housing from capital gains tax. I don’t favour that, because consistency with other parts of the tax system would require that mortgage interest payments be deductible. That would in turn almost certainly encourage people to take on more debt, and would thus inflate the demand for housing, putting further upward pressure on prices. And it could well end up being revenue negative. Sadly, however, the political calculus to which I referred earlier means that there is probably less chance of any of these proposals being taken up – let alone all of them – than there is of Andrew Demetriou calling a press conference to announce that Tasmania really should have its own team in the Australian Football League. Politics – more than any other single factor – means that Australians are likely to have to live with a dysfunctional housing system for a long time yet to come. Advisory Council for Intergovernment Relations (1982), Australian Housing Policy and Intergovernment Relations, Discussion Paper No. 14, Hobart. Australian Bureau of Statistics (2012), Census of Population and Housing: Estimating Homelessness, Catalogue no. 2049.0, Canberra, November. ⎯⎯ (2013a), Building Activity, Catalogue no. 8752.0, March 2013, Canberra, July. ⎯⎯ (2013b), Housing Occupancy and Costs, Catalogue no. 4130.0, 2011-12, Canberra, August. ⎯⎯ (2013c), Household Wealth and Wealth Distribution, Australia, Catalogue no. 6554.0, 2011-12, Canberra, August. Economist, The (2013), ‘Levying the Land’, London, 29 June. Friedman, Milton (1978), Interview with the Times Herald, Norristown, Pennsylvania, 1 December; available at http://www.cooperativeindividualism.org/friedmanmilton_interview-1978.html. George, Henry (1905), Protection or Free Trade, Doubleday Page & Co, New York. – Detailed Analysis, Volume 1, Commonwealth of Australia, Canberra, December. Productivity Commission Inquiry into First Home Ownership, Submission by the Reserve Bank of Australia, Sydney, November. Smith, Adam (1776), An Inquiry into the Nature and Causes of the Wealth Of Nations – Penguin Edition ed. by Andrew Skinner (1982), London. Soos, Philip (2012), Speculative Vacancies in Melbourne: 2012 Report, Earthsharing Australia, Melbourne, June. Yates, Judy, Hal Kendig and Ben Phillips (2008), Sustaining Fair Shares: the Australian Housing System and Intergenerational Sustainability, AHURI Final Report No. 2011, February (and updated by communication from Yates). This document does not purport to constitute investment or business strategy advice. It should not be used or interpreted as an invitation or offer to engage in any kind of financial or other transaction, nor relied upon in order to undertake, or in the course of undertaking, any such transaction. No representations of any kind are made, nor are to be inferred, about any securities or financial instruments whatsoever based on anything in or inferred from this document. The information herein has been obtained from, and any opinions herein are based upon, sources believed reliable. The views expressed in this document are those of the author. Neither the author, nor any entity by which he is employed, nor any body of which he is a member or with which he is in any other way associated or affiliated, nor any of their affiliates or subsidiary or related entities however makes any representation as to their accuracy or completeness and the information should not be relied upon as such. All views, opinions and estimates herein reflect the author’s judgement on the date of this document and are subject to change without notice. The author, each and every entity by which he is employed, and each and every body or entity of which he is a member or with which he is otherwise associated, their affiliated and subsidiary entities expressly disclaims any responsibility, and none of them shall be liable for any loss, damage, claim, liability, proceedings, cost or expense (Liability) arising directly or indirectly (and whether in tort (including negligence), contract, equity or otherwise) out of or in connection with the views, opinions and contents of and/or any omissions from this document except to the extent that a Liability is made non-excludable by legislation. Here speaks the voice of the master. with these areas to-day as people had work, a reason to make an effort and less idle time. Fair points Anthony. As Saul points out, negative gearing is 92% ineffective in adding to supply. The tragedy is that property spruikers such as Dymphana Boholt have moved beyond negative gearing. There are enough tax breaks via trusts and SMSF’s to avoid a cash sink such as NG. In the end we will need to target the naturally rising value of land as a tax base. This will ensure more efficient use of land and urban locations. We can use this revenue to placate the right with lower taxes and the left with urban density & self funding public transport. But as you say, how to get past the vested interests! Bizarre that MP’s pawn their policies to pay for advertising on what was once known as the ‘public airwaves’. Very nice treatise. I agree with every point made except that I think there WOULD be an investor strike but I doubt it would have much effect. To Anthony. I don’t think limiting negative gearing to new property goes far enough. Just the building and not the land is the ticket. I am a property investor and I am taking advantage of the rules because it’s good for me, not because it’s good for the country. I applaud all the suggestions Saul had made even though they are no good for me. But I guess that’s the point. Anecdotally, I feel that there is also an underlying issue with housing affordability. Many young people, recently graduated from university or such like and earning very good wages do not appear to want to enter the housing market at the affordable end. They see what their parents have, with quality homes in relatively affluent areas and want the same. There appears to be an unwillingness to “start at the bottom of the housing ladder” and purchase a modest home, unit or apartment in a ‘developing’ suburb. They want their first purchase to be a new dwelling in a nice suburb, which they realise they cant afford and thus don’t buy, but keep renting in these same areas. As they’re paying higher rentals for these types of dwellings, their ability to save sufficient deposit for a home diminishes. I place my father into the category of early baby boomer and I can assure you, that to accumulate his assets ( which ultimately were taxed beyond comprehension) there were many sacrifices made. Simply put our youth have been spoiled and this will not bode well for their futures, unless they are willing to make those sacrifices, just as those baby boomers did. Mark – i posted your response on our Dont Buy Now facebook group and this gem of a response might enlighten you to the pressures we face today. 1) Boomers had many advantages that our generation didn’t have. One being that many of them got a free degree (or at least a lot cheaper than the 40K I was saddled with following my double degree). So spare me the ‘boomers had it so tough’ routine. The cost of living has gone up dramatically and anyone that believes the official inflation rates is a moron that is not worth wasting your time on. Fuel, Healthcare, Education, Parking and of course, Houses / Land have increased well above wage growth. The only reason they can claim inflation is 3% or so, is because they lump in the falling costs of international travel and electrical / whitegoods. 2) The ability of 30 year olds to save has been greatly diminished by the RBA and the Government preference for debt slaves over savers. At 4% retail deposit rates on a 12 month fixed term, I recently realised that my savings wouldn’t even keep up with real inflation if I parked my money in the bank. So although 50-60 year olds moan about the cost of their mortgage payments under 17% interest rates (circa 1991), they forget to mention how easy it was to save when your money was able to grow simply by being prudent. 3) The idea of a “housing ladder” is a marketing tool, sold to young naïve people by patronising baby boomers. Climbing a ladder is a silly metaphor when it involved buying overpriced property. Climbing a slippery did with oil poured down it is more apt. The ladder concept was suited to a time when prices continued to rise, so each 10 years, the home owner could upsize by taking out some of their equity gains and piling on a little more debt. As prices continued to rise, this strategy actually worked. Over the past 5 years, anyone who bought a house has climbed nothing. In fact, the only reason most of them haven’t fallen off the ladder is because of emergency actions by the RBA. But in reality, I have stopped arguing with people like Mark. They are never going to be convinced. You could show them graphs that clearly show the price of land increasing well above wages…or you could show them the rate of mortgage debt growth over the past 20 years….and they will still come back to you with statements like “Rent money is dead money” or “You have to start at the bottom and climb the property ladder” or my favourite… “So you want people to lose their home!”. …. and as Karl says, ‘some people will still come back to you with statements like “Rent money is dead money” or “You have to start at the bottom and climb the property ladder” or my favourite… “So you want people to lose their home!”’. The fixation on making ownership work better with tweaking here or there is clear, but I reckon this fixation is blinding us to the opportunity to to do something new to increase public housing which is totally forgotten in this discussion. Saul Eslake is one of those rare people who sees the big picture, unlike the politicians who are beholden to their party lines and ignore the people who they are supposed to represent. I suggest that you all get a copy of Nick Cater’s “The LucKy Culture” and carefully read it from cover to cover. You will soon realise we are now at the mercy of a new ruling class that has based its whole approach to politics on a bunch of elitist academics that are so removed from the real world that they imagine they are helping us, whilst they drag us a nlong way south of the egalitarian society that once existed in Australia. I read with interest Mr Eslake’s views on cutting negative gearing for new investors (2014). In my previous email to Mr Eslake a few years ago and his response back then his views was that investors should not get tax privileges – I disagree with his view in 2014 that we should now create a 2 tier market with existing investors maintaining all privileges. I believe that existing investors, should through some mechanism be brought into the existing tax net and then over time be brought on par with the taxing with new investors wherein the tax privileges are removed. This would increase the stock of property on the market at a faster rate and have a more speedy (positive) dampening effect (with existing investors retaining some benefits but an increasingly reduced rate – if they can receive 16% returns then they shouldn’t complain about these returns being cut to 8% or some lower figure through taxation). Investors have unfairly benefited from the largesse of successive government’s poorly thought out policy on this area – and one which has such immense impact on societal cohesion. It is incredibly short-sighted. It is time to change the psychology of people – houses are essentially for living – not a speculative money making venture. I think we have to strengthen Saul’s resolve by quantifying the number of home owners under extreme financial duress (purchasers over the last decade) plus those locked out. That number must be more than the 2.1m investors Saul sees as a political deterrant to change! Thanks for your support. Allan are you saying covenants on land by the aged are a cause of the housing supply crisis? I’d like to read more detail on that re the US situation.